From the Dream 9, to the Dream Defenders, to San Francisco, to Chicago, young people mass for social justice. E-mail questions, tips or proposals to studentmovement@thenation.com. For earlier dispatches on student and youth organizing, check out last week’s post. Edited by James Cersonsky (@cersonsky). 1. When Will the Dream 9 Be Set Free? How would you feel if you were forced to leave your home? Your family? Everything you’ve ever known? For undocumented youth, this is exactly what’s demanded of them. Either through deportation or lack of access to jobs and education, many are forced to leave for countries that are foreign to them. On July 18, three undocumented youth from the National Immigrant Youth Alliance left the US, where they have grown up for the majority of their lives, and went to Mexico. 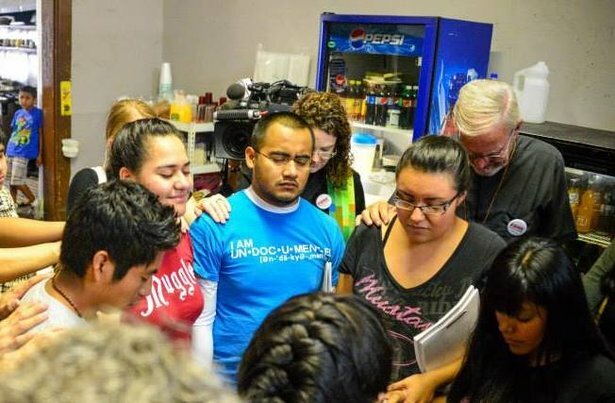 On July 22, they presented themselves to US Customs and Border Patrol agents in Nogales, Arizona, with six other youth who had been deported, and were arrested and detained at Eloy Detention Center. Joined by 70 other detainees, they have all been on hunger strike for the past week. Nationwide, the Bring Them Home campaign has urged immigrants and supporters to fight for the Dream 9—and the many more like them—to be allowed to come home. In the past, we’ve stopped hundreds of deportations by forcing the Department of Homeland Security to move its ugly business out from behind closed doors. We have infiltrated detention centers, participated in acts of civil disobedience and occupied campaign and congressional offices to force both friends and foes to take a stand. We’ve found the next door to kick down, and we won’t stop until we’ve won. 2. What’s at Risk With Voluntary Detention? Right before Lulu, an Undocuqueer activist in Chicago, left for Mexico City, we had many conversations about what we needed to do to empower the community to come out of the shadows and defend itself from more deportations. Within the detention center, the women collecting stories are organizing other women to fight their detention and threat of deportation. We remain autonomous UndocuQueer artivists with a strong stance against these injustices happening in our communities. As the most affected by anti-immigrant laws and people, we feel the need to speak for ourselves even if it means sacrificing our freedom. Aside from the 2 million who have already been deported under the Obama administration, it’s estimated that nearly 5 million will not qualify for Registered Provisional Status under S.744, the Senate’s draconian immigration bill. Right now, we are asking President Obama to grant the DREAM 9 humanitarian parole and are calling for their immediate release. Numerous states from New York to Pennsylvania, Kentucky to California, have held solidarity actions calling for the release of the DREAM 9. On July 24, the New York State Youth Leadership Council organized a human chain outside of Senators Gillibrand’s and Schumer’s offices. We will continue to pressure New York legislators to actively fight for the release of the DREAM 9 and will begin a hunger strike next week to stand in solidarity with the DREAM 9—who are also on a hunger strike. These actions will continue until the Obama administration delivers its verdict. On July 26, hundreds of immigrant students, along with our families and activists, confronted Congressman Paul Ryan at a bilingual town hall meeting on federal immigration reform in Racine, Wisconsin. Students from Youth Empowered in the Struggle and Voces de la Frontera pressed Ryan on the need for citizenship for DREAMers and our parents. Twelve adults in the crowd, along with all children present, stood up to represent the twelve families that are torn apart by deportation every month in Racine. My grandfather recently passed away; because of current immigration laws, my father and I couldn’t see him the last thirteen years. Mine is just one of many similiar stories that the Congressman heard at the town hall.​ Ryan discussed a proposed timeline for piecemeal legislation with five separate bills. One of the bills included a path to citizenship that could take up to fifteen years—far from broad legislation that would prioritize family unity and a path to citizenship for all 11 million undocumented immigrants. #TakeoverFL started on July 16, the first official Takeover Tuesday. Dream Defenders from across Florida came together to march into Governor Rick Scott’s office and demand a special legislative session to correct the environment in Florida that led to the death of Trayvon Martin and the acquittal of George Zimmeman. Scott was not in his office, but we made a commitment to stay until our demands were met. On day three, we met with the governor and laid out Trayvon’s Law, which addresses racial profiling, the repeal of Stand Your Ground and the school-to-prison pipeline. We demanded that he convene a special session—which he rejected. On Friday, July 26, we called a mass mobilization to the capitol and a visit from long time activist and entertainer Harry Belafonte. Around 500 people filled the capitol from the governor’s office out to the rotunda. We announced the proclamation that would be signed by the governor if he called a session. On Tuesday, July 30, our fifteenth day of living in the Capitol, we held Florida’s very first People’s Session, a special session to write, review and debate Trayvon’s Law, and were joined by Reverend Jesse Jackson. We have taken the necessary steps because the governor and the legislature have failed to do so themselves. On June 24, Philadelphia’s Youth United for Change went to Tallahassee, Florida, to support the Dream Defenders on its campaign to end racial profiling, the school-to-prison pipeline and the oppression of black youth. Alongside people from DC, Baltimore, New York and Florida—and Harry Belafonte—we made a statement of youth power. Dream Defenders’ work is very similar to YUC’s, which includes Pushed Out, a campaign to address the drop-out crisis in Philadelphia, and Safe to Count on Me, a response to curfew laws and zero tolerance policies in schools. These problems have scared our communities across the country. YUC supports Trayvon’s Law. On July 12, the Office of Civil Rights announced a federal investigation of Swarthmore College for allegedly mishandling reports of sexual assault and sexual harassment. Thirteen students claimed that the College had violated Title IX, after receiving a staff member tip-off that the administration had taken steps to actively cover up or even destroy evidence of sexual assaults on campus. Four days after the announcement, Swarthmore announced major changes to its sexual assault policy which included hiring a new, full-time Title IX Coordinator, eliminating the Drug and Alcohol Counselor/Administrative Liaison to Fraternities position, hiring an advocate for survivors of sexual assault and harassment and reviewing the current alcohol policy. The College has stated that it is committed to fully complying with the federal investigation. While these developments are positive, we remain determined to hold Swarthmore accountable for its past missteps. On July 12, Free Cooper Union’s sixty-five-day occupation of the presidents’ office ended with a negotiated agreement between the occupiers and the Board of Trustees. The board agreed to form a 16-member Working Group seeking alternatives to tuition, create a dedicated space on campus for organizing and grant amnesty to occupiers. This year’s incoming freshmen will receive full-tuition scholarships for their entire time at Cooper. Meanwhile, supporters of FCU are gradually taking over the board and Alumni Association. We’re working closely with trustees Mike Borkowsky and Jeff Gural on the Working Group; a write-in campaign during the occupation seated Friends of Cooper’s John Leeper and trust and transparency advocate Kevin Slavin as trustees; student representatives will join the board in December; and the Alumni Association Council, packed with FCU supporters, has begun to hold monthly, public, livestreamed meetings. Now, we’re building independent channels of communication and kicking off a “parallel fundraising” campaign. We’ve successfully incorporated FCU and are seeking fiscal sponsorship so we can start taking in tax-deductible donations. In the fall, we’ll be conducting a “disorientation” for incoming freshmen. While California undertakes sweeping reforms that will limit the accessibility of community colleges, the Accrediting Commission for Community and Junior Colleges moved to disaccredit City College of San Francisco, effectively closing it by July 2014. For two years, students have worked in solidarity with faculty, staff and community to protect the mission of City College as an accessible, affordable and democratic institution. We have held teach-ins and rallies, lobbied elected officials and engaged the San Francisco Bay Area and the entire campus community to resist the downsizing of our college and the rise of privatization. Once we heard ACCJC’s decision, thousands came out to support our demonstration in front of the Department of Education in San Francisco in July. We know our college’s record of high academic quality—and that the ACCJC is an arm of the movement to privatize education, led by foundations like Lumina and Gates. We are working to build unity with faculty, unions and students elsewhere to resist privatization and promote the narrative that education is a human right. The Chicago Students Organizing to Save Our Schools participated in another speakout during the Chicago Board of Education meeting this past Wednesday, July 24. Students focused on themes ranging from charter expansion, to school closures and budget cuts, all the way to a “Declaration of Education.” Each speech ended with the same question to the board: “Are you listening to us now?” The final student delivered a speech asking the board to agree to CSOSOS’s demands: monthly meetings between students and the board; an elected, rather than appointed, board; and the usage of excess funding from Chicago’s TIF program for public schools. The board ignored the question; in response, the student began a “mic-check,” and others began chanting while creating a human chain. Within moments, security officers forced the students out of the Board of Education building.